In collaboration with Sunset Hill Community Association, Sustainable Ballard hosted a Solar Fair at Sunset Hill Community Clubhouse – 3003 NW 66th. This was another nice opportunity to meet neighbors and learn more about local solar energy. 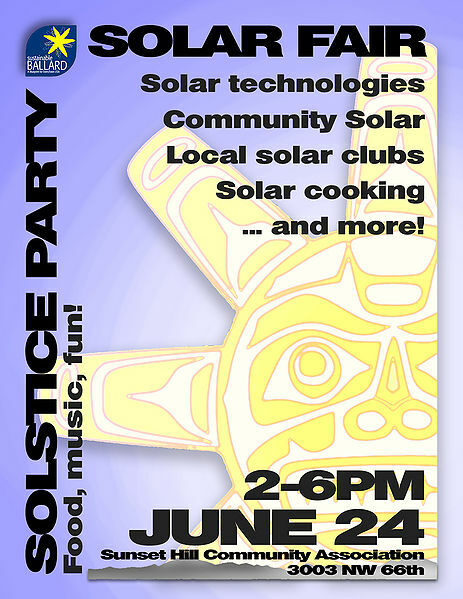 There was information on community solar, solar cooking, plans for a local solar substation, various technologies comparisons, creative uses for solar, PLUS music, food and games (including Solar Bingo!!). Attendees were able to check out the new(ish) SHCA rain garden and cistern installations! This event was free to the public.